ICCHS was well represented at the annual British Rock Art Group (BRAG) conference at the University of Edinburgh on Saturday 3 May 2014. Organised by Dr Tertia Barnett (School of History, Classics and Archaeology), the programme comprised 14 papers, seven posters, and several interactive sessions, including a stone carving workshop! 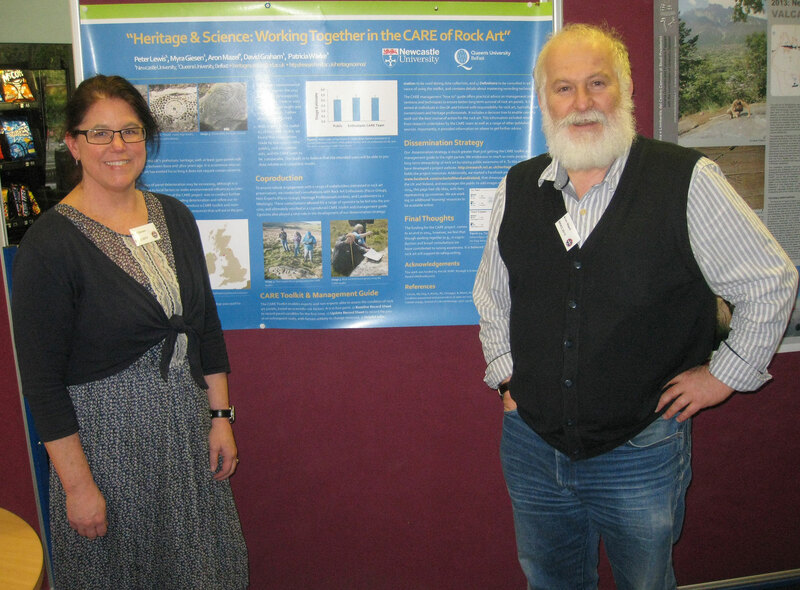 Myra Giesen presented a paper ‘Expanded results in the CARE of rock art in the UK and Ireland’, on behalf of the CARE project team at Newcastle University and Queen’s University Belfast . She updated the conference about the fieldwork that has been completed in Northumberland, Dumfries and Galloway, and Donegal and some of the insights that this has generated. This includes a possible link between the deterioration of rock art and the height of rock art panels and salt content in soils. The possible relationship between these factors and climate change is also being explored (Giesen et al. 2014). Myra’s presentation was complemented by a poster entitled ‘Heritage & Science: Working Together in the CARE of Rock Art’ which highlighted the CARE fieldwork and results and also mentioned the focus group meetings that the CARE team held in Northumberland to obtain feedback from a range of stakeholders on the monitoring toolkit that is being developed. Aron Mazel’s presentation covered his research into the richly painted Didima Gorge in the uKhahlamba-Drakensberg mountains in South Africa where Harald Pager recorded 3909 paintings in 17 rock shelters in the 1960s. Aron has linked the abundance of rock art in the gorge to its acoustic qualities (Mazel, 2011) and is now investigating the distribution of painting themes along the 5.5 km gorge. Visit Andy Curtis’s Heddon on the Wall local history blog for more commentary about BRAG 2014. In March Aron Mazel was invited to share experience and findings from his work on Northumberland rock art with international colleagues at ‘The First International Conference on Rock Art in the Negev Desert and Beyond’ (27 – 28 March, 2014) in Sde Boker, Israel. Organised to coincide with the inauguration of the new Negev Rock Art Center this superbly organised and interesting conference included speakers from 11 different countries who deal with rock art, its management and interpretation, in the Negev and in surrounding countries such as Saudi Arabia, Syria, Oman, Egypt and Jordan. Aron’s presentation ‘On the ground and on the web: interpreting Northumberland rock art for the public since 2002’ dealt primarily with Aron’s work on the Beckensall website and Rock Art on Mobile Phones (RAMP) projects and the insights and lessons that have been gained from this research. Interpretation was a highly relevant issue for the conference as the Negev Rock Art Center is in the process of creating a rock art park, which will involve interpreting rock art for the public. During and after the conference the participants were shown some of the rock art that will form part of the park. 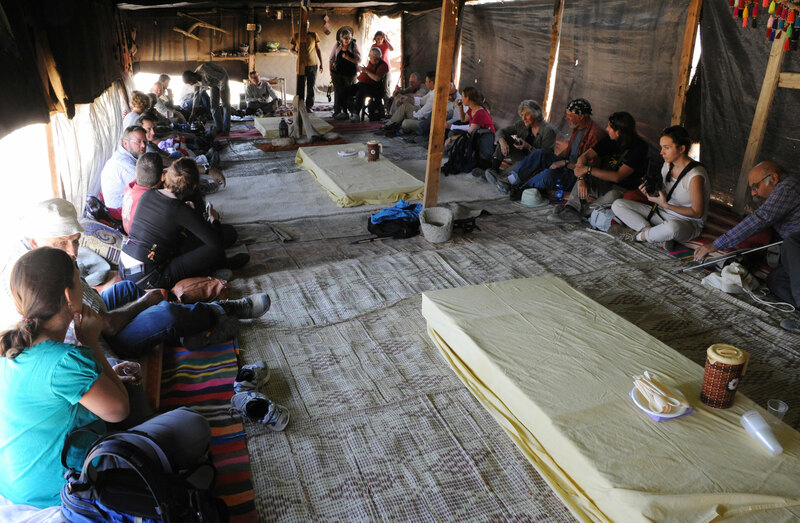 They had the opportunity to interact with representatives of the local Bedouin community to exchange thoughts and feelings about the creation of the park, with particular reference to the economic benefits through tourism, and the different approaches that should be taken to its management and interpretation. In this seminar Susan Ashley, cultural studies scholar and cultural management lecturer at Northumbria University, will offer some personal thoughts about the ‘value’ of heritage. Starting from her experiences as a front-line interpreter, planner, consultant, and now academic in the field of heritage, Susan examines heritage as a ‘structure of feeling’: a sensibility or consciousness or process of understanding our relation to the past. Heritage-as-process is about our thoughts and experiences in the present, a social experience actively lived and felt. In her paper for ICCHS Susan will weave these ideas into stories of work and research experiences over the years with ‘Other’ sites of heritage-making, from Algonquian rock art to Black history to her current work with the Chattri memorial group in Brighton. Susan Ashley‘s work explores the ‘public’ nature of heritage knowledge production, and issues around heritage representation and management. Her research interests draw on a long professional practice working in the media and heritage organisations across Canada. Susan’s recent edited book ‘Diverse Spaces:Identity, Heritage and Community in Canadian Public Culture’ is published by Cambridge Scholars Publishing, 2013. 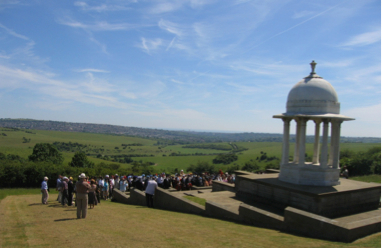 Over 100,000 war memorials exist in the UK, with the majority commemorating the two World Wars and other historic conflicts. Unfortunately, many memorials are made of exposed stone and they are losing the fight against environmental weathering with critical incised and relief inscriptions slowing fading away. 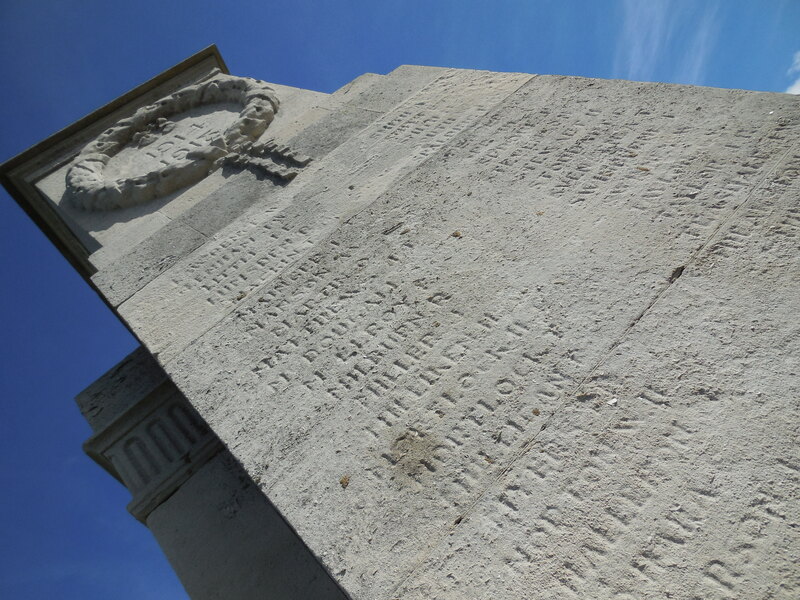 Weathering away of names on a WW1 memorial. Dr Myra Giesen, from ICCHS, is working with Professor David Graham (Civil Engineering and Geosciences, Newcastle University) and MEng student, Laura Chatwin, to collect physical data on the current condition of twelve key monuments in NE England (e.g., elemental content using X-ray fluorescence, salt crystallisation, water seepage, local and historic air quality). While Laura is focusing on the science underpinning weathering of the stone itself, Myra is looking at how this information and other variables can be used to increase management options for such memorials, including guidance for host municipalities and private individuals.